Wednesday 4th May-Australian Market Wrap | Beeks Downunder-Because not all financial news is boring! he ASX 200 Index closed down 83 points to 5271, giving back more than half of yesterday’s gains. A 140 point fall on Wall Street overnight together with concerns about world growth and the local economy faltering set the tone this morning. Iron ore fell heavily in the Chinese futures market which placed negative pressure on some of the iron ore miners today and Resources were among the hardest hit. Banks were also sold off as shareholders locked in profits following yesterday’s RBA interest rate cut. 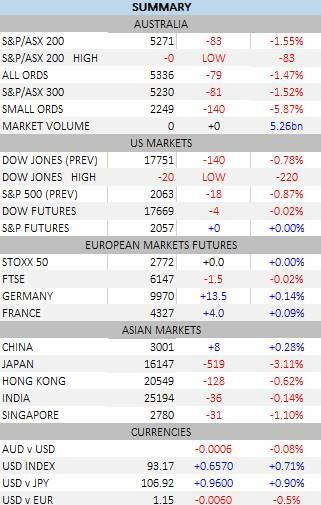 Asian markets were slightly weaker with Japan closed. AUD falls to US75 cents. Dow futures down 4 points. BHP -9.36% after facing more problems over Samarco with a $58bn lawsuit in Brazil. Morgans says the news would continue to disappoint, which it did, given a compensation framework had already been agreed upon with Brazil’s Federal Attorney General and the two states affected. There was also heavy selling in Woolies -7.00% following cuts to broker estimates and a rating downgrade by S&P. The credit ratings agency downgraded to BBB. But media headlines were solely focused on the Scott Morrisson “do no harm” budget. It did do some harm, mainly to wealthy superannuants. To read of our take on the budget click here. 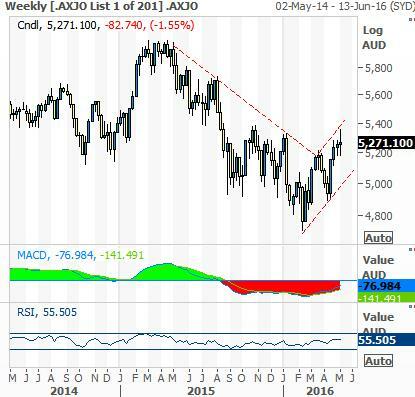 This is the ASX 200 chart on a weekly basis showing the break of last year’s downtrend. After the 80 point fall today we are still trading at the upper end of this range…the market could easily fall 200 points and still be in a new uptrend. 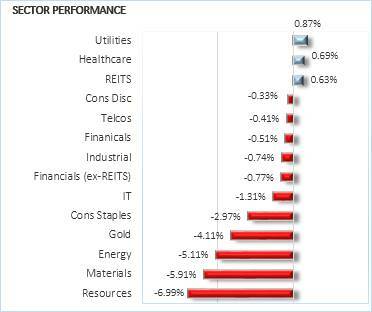 Resources were the clear laggards with the sector closing -6.99% on falls in commodity prices overnight. BHP -9.36% was hit with the iron ore price/Samarco civil suit double whammy. Other miners were also weaker, RIO -7.54%, FMG -4.86%, South32 (S32) -8.33% after presenting at a Macquarie conference. FMG shares fell despite news that it cut its debt by US$650m. Energy stocks didn’t do much better after the oil price fell US$1.13 or 2.52% to US$43.65 a barrel. The sector closed -5.11%. Santos (STO) shares fell 8.70% after Chairman Peter Coates faced a barrage of questions from shareholders over the massive loss of value at its AGM. Origin Energy (ORG) -4.33%, Caltex (CTX) -1.65%, Beach Energy (BPT) -5.59%, Senex (SXY) -7.69% and Sundance Energy (SEA) -9.09% all weaker. 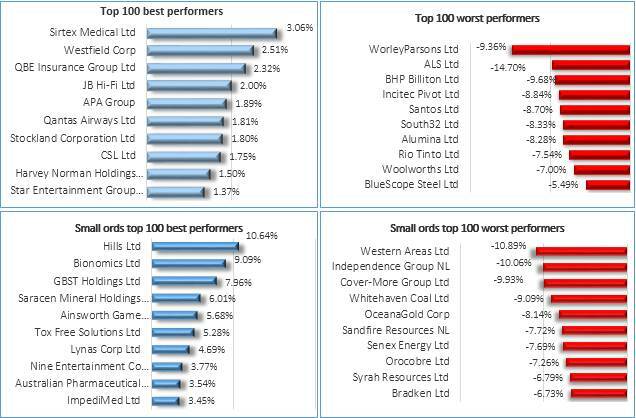 WorleyParsons -14.7% one of the worst performers. Gold stocks also had a terrible day with the gold index -4.11%. Some of the worst performers were OceanGold (OGC) -8.14%, Perseus (PRU) -4.72%, Evolution Mining (EVN) -6.60% and Resolute Group (RSG) -4.93%. 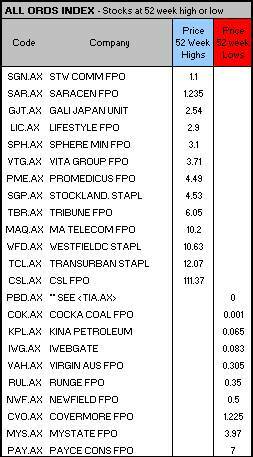 Utilities stocks were the best performers with Duet Group (DUE) +1.32%, APA Group (APA) +1.89% and Spark Infrastructure (SKI) unchanged. The big banks were down with NAB -1.19%, CBA -0.55% and WBC -1.14%, while ANZ -0.6% had a relatively good day after yesterday’s 5.6% post result gain. QBE +2.32% after it said it was on track to meet its FY guidance and has confirmed its plan to increase its dividend payout ratio. Industrials were mixed. Transurban (TCL) +0.5% while Sydney Airport (SYD) -0.14%, Cimic Group (CIM) -1.17% was sold off, Brambles (BXB) -0.86% and Macquarie Atlas Road (MQA) -0.98%. Telstra (TLS) shares closed down -0.35%. Healthcare stocks also outperformed. CSL +1.75% at $111.37 hitting a new all-time high at $111.87. Sirtex Medical (SRX) +3.06%, Healthscope (HSO) +1.08%, ResMed (RMD) +0.67% and Primary Healthcare (PRY) unchanged. Some of the laggards were Mesoblast (MSB) -5.65% and Regis Healthcare (REG) -6.60%. Cover-More (CVO) fell -9.93% following yesterday’s earnings update and a broker downgrade. REITS also stronger including Westfield (WFD) +2.51%. Nearmap (NEA) shares rose by 6.42%. It issued a trading update earlier this week. Speculative stock of the day: Middle Resources (MDI) +200% after acquiring Sandstone gold mining and processing project in WA plus raises $400,000 for working capital. BHP -9.36% suffered a shocking day as a combination of falling iron ore pricing and the shock announcement that the Brazilian Federal Prosecutor has filed a $58bn claim against the company for punitive damages following the Samarco tragedy last year. Fortescue Metals (FMG) -4.86% has cut its debt for the second time in two weeks, announcing plans to repay $US650m ($867.8m) of the senior secured term loan that falls due in 2019. The repayment should be complete by May 16. Woolworths (WOW) -7.00% had its long term credit rating cut one notch by S&P to BBB from BBB+, just two levels above a junk rating, citing continued market share losses in Woolworths’ key food and liquor business, anticipated losses at BIG W, and Woolworths’ plan to invest an additional $150 million into reducing prices and improving service to restore sales growth in its supermarkets. 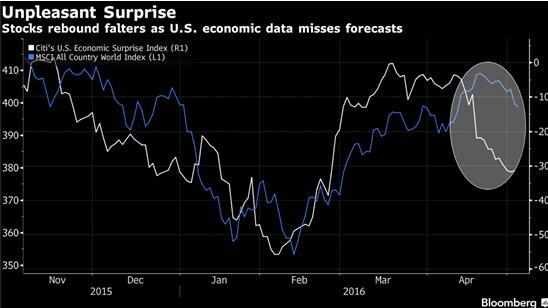 Cuts to analysts forecasts weren’t positive for share price performance either. Santos (STO) -8.70% AGM today was a prickly affair as the company said they would take a highly disciplined approach to restoring shareholder value. South32 (S32) -8.33% will resist chasing deals and warned that some of its rivals may face a lot of pain as planning had been inadequate to cope with the commodity sell off. 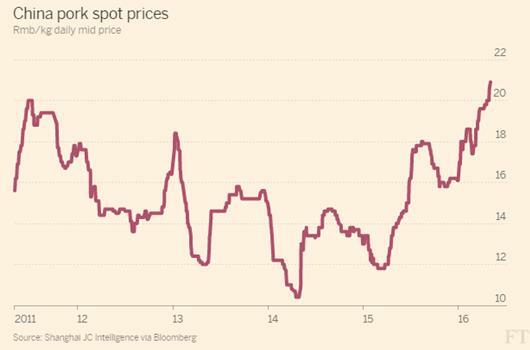 S32 also expects commodity prices to weaken in the second half of the year. Some good news today for perennial disappointer QBE +2.32%. It says it is on track to meet its full-year guidance and has confirmed plans to increase its dividend payout ratio. CEO John Neal told the AGM that the first three months of 2016 had been in line with February’s forecast of a gross written premium of between $US14.2-14.6bn. QBE still plans to raise its dividend payout ratio from 56% in 2015 to as much as 65% of cash profits starting with its 2016 interim distribution. Sigma Pharmaceuticals restating its full year guidance and said it is on track to lift earnings by at least 10%. Management is confident of delivering EBIT growth of at least a 5% for the next two years. SIP closed +0.45%. New IPO aspirant InfoTrack has delayed its IPO. The proposed listing had been for June but now looks like the $500m float will go ahead in July or August. The company is an information-workflow software platform. 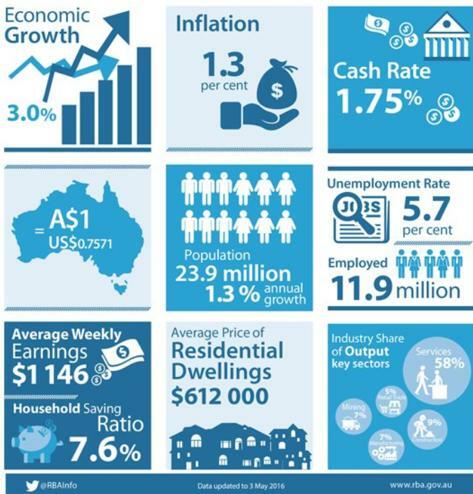 The Australian Industry Group’s Performance of Services Index (PSI) rose 0.2 points to 49.7 points in April. A number below 50 indicates the sector is shrinking, but the higher number shows the rate of contraction was slower than in March. Across the ditch in NZ, employment rose 1.2% from the fourth quarter, when it gained a revised 1%. The forecast had been a 0.6% increase. The jobless rate rose to 5.7% from 5.4% as the labour force increased; analysts tipped 5.5 %. China has tapped into the emergency pork reserves (?) as the prices have risen to record highs. A shortage of breeding sows and a growing domestic demand has driven imports higher. Who would have guessed the Chinese would have had a strategic stockpile of pork? Japan closed again today for national holidays but China slipped 0.18%. Is this the start of the sell in May and go away? 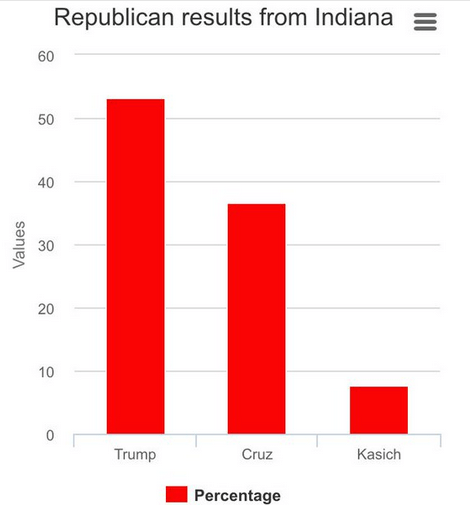 Trump is now the presumptive Republican nominee as Cruz has dropped out.